This House would provide a path to citizenship for immigrants living illegally in the US. Teams from St. Luke’s School in New Canaan were the top two finishers in the team competition. Congratulations to Ruth and Laura Mercedes, Marco Volpitta, Kaitlyn Necakov, and Amelie Warneryd (pictured top left). The team of A.J. 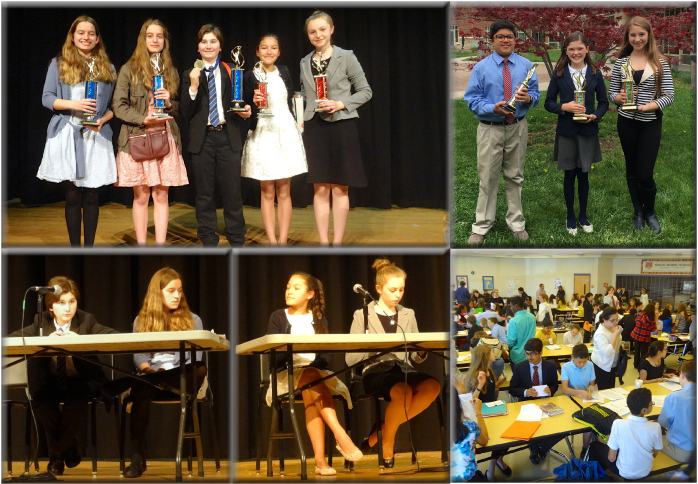 Juneja, Grace Flynn and Ariel Mayer from Westfield Academy placed 3rd (pictured top right). Marco Volpitta from St. Luke’s School earned the first place speaker award. Katrina Thunhorst from Bethel Middle School placed second and Kendall Kennedy from Classical Magnet School was third. Thank you to the English Speaking Union, Greenwich Branch for sponsoring the league and for sending Robert Whitby, Kathleen Whitby and Natalie Pray to judge and time. Thank you to John Rook and Antoinette Kuslik and Smith Middle School for hosting us. And a huge thank you goes to our judges including sixteen high school debaters. Thank you to Coach John Rook and the Smith Middle School for hosting the CT Middle School Debate League’s largest tournament to date. This was the final tournament of a very successful year for the CMSDL. Visit our website for information about the May 25th coaches’ meeting.